Gardeners tend to agree that once you have experienced vegetable gardening for yourself it’s hard to beat the taste compared to grocery produce selections or the satisfaction that comes from toiling in your own soil. The bonus for many who enjoy working their garden plots comes in planning your crops to have two planting times—during spring and late summer. If you planted vegetables in mid-summer than the fall harvest times are near or happening now. 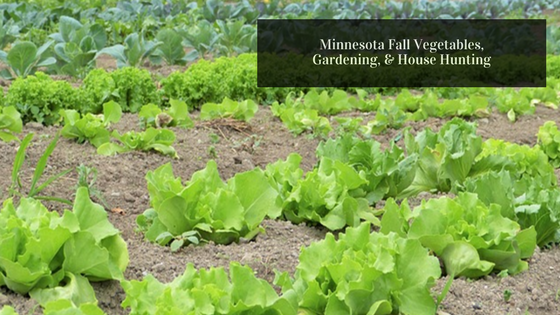 Minnesota succession gardeners around the Twin Cities region will soon be reaping the harvests of their late-crop growing season. Freezers and pantries will soon be filled with an abundance of canned goods to enjoy over the winter months. House hunters who include gardening on their must-have or want lists will take pleasure in knowing the climate is right across the region for two crops. With a bit of forethought and attention to the planting times the cornucopia on your Thanksgiving table can be filled with vegetables from your own garden. With your house hunting needs placed in the capable and knowledgeable hands of their RE/MAX Alliance Realty REALTOR®—who is committed to finding the best matches—this eases the mind of any gardener who envisions how their vegetable patch will grow once property ownership takes place. What Grows Well as a Late Crop? The soil prep work before sowing is minimal. Before the next crop is planted turn the soil and mix in some balanced fertilizer to replenish the nutrients used up by the first crop. Then you’re all set to begin planting. Another alternative for a second crop is “green manure.” Green manure includes legumes such as vetch, alfalfa, clover and peas; grasses such as annual ryegrass, oats, winter rye, and winter wheat; and broadleaf plants such as rapeseed and buckwheat. Planting green manure will limit soil erosion plus add organic matter to keep your soil rich for a better planting season in the spring. The average maturity days for second-crop plantings range between 30-60 days allowing numerous dates during midsummer for planting. Check with your local greenhouse or the University of Minnesota Extension for information on specific plants. If you’re a gardener with home buying on your mind don’t hesitate to contact Tom Schooley, your RE/MAX Alliance Realty REALTOR®. Tom will work with you to locate properties across the Minneapolis/St. Paul region that include both your must-haves and your gardening needs.